A huge piece of land that is owned by the Philippine government, Botanical Garden, like Burnham Park is one of those prime pieces of real estate that provides priceless peace and tranquility to a city that is in danger of becoming an urban jungle. Said to have been at one time a zoo and actually named the Botanical & Zoological Garden, the Baguio Botanical Garden has been known, officially and unofficially by many names -- Igorot Village (for the different Cordillera huts and statues that decorated the park, Imelda Park (who was for a long time the First Lady of the country) and, most recently, Centennial Park in celebration of 100 years of the Summer Capital of the Philippines. just 1 kilometer from Session Road, along beautiful Leonard Wood between Teachers Camp and Wright Park. You will be welcomed by a bas relief sculpture made of cement and stone depicting the different rituals of the Cordillera tribes, with real live Igorots who will be more than willing to pose for photos for a small fee. is a beautiful bronze sculpture by famous Filipino artist Ben-Hur Villanueva depicting the original builders of the city, composed of Cordillera natives, Americans, Chinese and Japanese working together. This work of art is located right past the gate so it will be hard to to miss! Filled with towering pine trees, the Botanical Garden serves the dual purpose of providing visitors and residents valuable beathing space and re-greening a fast developing city with greenhouses and nurseries designed to propagate the flora and fauna species that will eventually find their way to parks and gardens around the Summer Capital. Stone steps and paths will guests around the different areas of the Garden, that include an Art Gallery (as the Botanical Garden is the home of the Baguio Arts Guild), pocket gardens developed and maintained by Baguio's sister cities, areas where folks from elsewhere have planted pine tree seedlings, a small row of souvenir stalls selling native handicrafts. Then there are the different relics from Botanical Garden's Igorot Village days with large statues depicting different Cordillera tribesmen and symbols, Cordillera huts that have seen better days that visitors used to be able to climb into to get a glimpse of the different cooking implements and home fixtures. Baguio Botanical Garden is also a favorite venue for tribal gatherings and rituals, open-air concerts and other community activities. It is also my favorite quiet and peaceful place in the City of Pines. 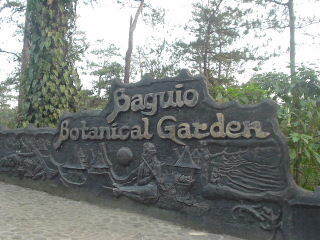 The main entrance to the Baguio Botanical Garden is along Leonard Wood Road, between Teachers Camp and Wright Park. From Session Road, head toward Leonard Wood Road. Past Teachers Camp, to your right, is the main entrance to Botanical Garden, where parking is available along the roadside. There are many, many jeepney lines that pass Leonard Wood Road, all emanating from the Central Business District (Plaza) so ride one that indicates Plaza to the following places: Mines View, Pacdal, Beckel, Country Club, Navy Base, Tuding, Itogon. There are also many taxi cabs that you may take to and from Botanical Garden. Open daily, daylight hours (they recently installed gates). Botanical Garden is FREE for everyone's enjoyment; picture-taking with the natives would cost about Php20.00/person/photo. 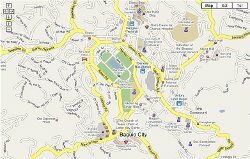 Getting to The Botanical Garden is very easy Click the image above to view the map of Baguio City Just keep zooming and scrolling in the general area of Leonard Wood Road near the city center.